This month I'm presenting the limited-edition node.js duplex stream tees designed by my co founder, the stream master and node.js wizard SubStack. This shirt is done in collaboration with Teespring. Teespring is basically Kickstarter for t-shirts. If enough people commit to buying a shirt, everyone gets their shirt. Otherwise nobody gets a shirt (and nobody gets charged). 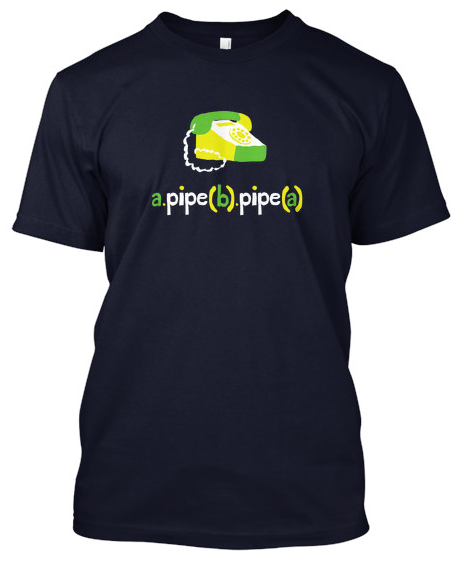 This tee illustrates the duplex stream pattern a.pipe(b).pipe(a) that sends the messages around like a telephone. The shirt is available on Hanes tees and is priced at $15. Do you love this shirt and want to get more geek shirts in the future? Subscribe to my blog and follow me on twitter for updates!